According to Bonnette, god is an eternal, unchanging will, that could not have been different than what it is, and it's will includes non-necessary things. That would mean it cannot be explained by necessity in principle, which can only mean god's will must be explained by something contingent. This can only lead to an infinite regress of contingent explanations, which means god could not have freely willed it because every explanation to why god wills the unnecessary things must refer to something else, and the infinite regress itself will need an explanation, according to the Thomist. Hence god is logically trapped out of free will, since free will requires (among other things) not being forced by outside elements. A theist here is forced to claim god is not forced by outside elements, but there is no ultimate explanation why god wills the unnecessary things. By definition there can't be. And here is where the Achilles heel of the Thomistic case for god cripples them. Once you admit there are other logically possible gods, you cannot say your god is necessary. For if the theist claims our universe isn't necessary because there are other logically possible universes, the same would apply to god. The theist can say the universe doesn't have existence as its essence, but technically neither does god. The theist just defines god as having existence as its essence, but obviously I can define the universe the same way. The theist can come back and say such a claim is impossible because the universe came into being and undergoes change, but obviously that presupposes presentism is true (which no one can ever prove). The theist has to prove presentism or possibilism at the very least to make his case even have wings, let alone get off the ground. Dr Bonnette has tried to prove true presentist-sense motion happens on Strange Notions before but he does not know what he's talking about. Motion doesn't disprove eternalism. Motion simply means something different on eternalism. Motion simply means that in spacetime, worldtubes are not all parallel. They are angled relative to each other, which means that at different times they are different distances. That's what motion is. This is why I love eternalism: it destroys the Thomist's metaphysic. Ok, but then the same is true with an eternal block universe: it eternally exists, and although it is not logically necessary, no other alternatives are possibilities at all. 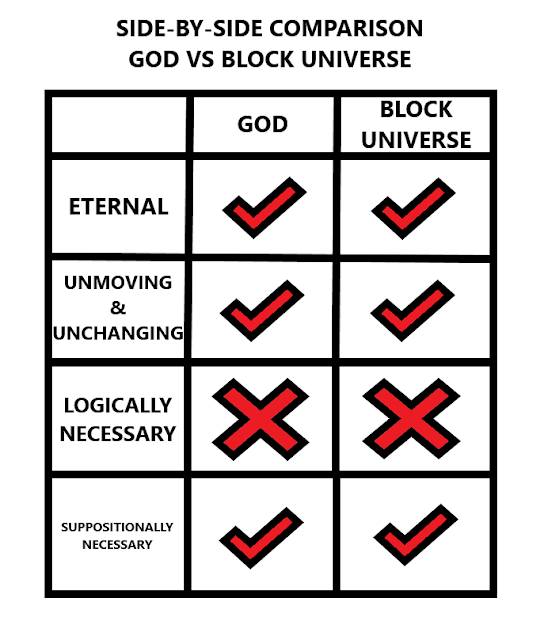 In fact, this is a perfect time to have a side-by-side comparison of god and the block universe. Dr Bonnette of course has no justification in saying god freely wills anything. He simply calls god's unnecessary will "free" since the other will is necessary. The fundamental explanatory problem of why this unnecessary will vs a different unnecessary will is still there. Since a necessary explanation is off the table as an option, the will can only be explained by an infinite regress of contingent explanations. Being determined to will lesser goods does not entail those lesser goods are done freely. It is logically possible to be determined to will something that isn't necessary. Furthermore, the claim of being "perfectly free" if granted for the sake of argument, does not get god out of the underlying dilemma that since it is the will in question isn't necessary, any explanation to why it is X rather than Y must have a contingent explanation, given the aforementioned Thomist's own PSR, thus the dilemma. (c) therefore, the explanation for god's lesser goods can only be an infinite regress of contingent explanations. I technically do not need to include the two options in (a). I could just say all explanatory chains must eventually terminate in a necessary explanation and still justify my point. God's "free will" cannot be used as an explanation, because even something freely willed must have an explanation. It's the type of explanation that implodes the theist's case. And that wraps up part 4. Some of this is indeed a bit redundant, but it's necessary for me to stress the point. When closely examined, you can see that for all the sophistication on Strange Notions, the arguments there implode under scrutiny. Dr Bonnette simply has no case for god's free will, and the linchpin of his case for god, and for that of Thomism, is exposed as nothing more than a clever word play, implying a logical necessity for his god's existence, yet it is really just an after-the-fact claim for his god's suppositional necessity—a claim the atheist could make about an eternal block universe. I will follow up with the refutation for part 5 shortly.